Every Saturday, I plan to post a portion of my stories from the once-in-a-lifetime roadtrip we took in 03/04. I’m working towards writing/publishing a book in the future that would include these stories, plus many more. December 4, 2003 was a cold, snowy night in southeast Pennsylvania – temps dipped down to 22 degrees. By choice, my husband Jerry and I, along with our three boys, Joshua 15, Joseph 13 and Jonathan 11, were homeless and unemployed. 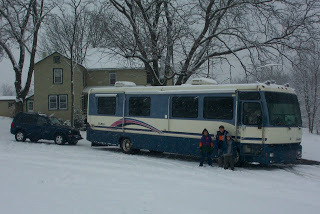 We slept in a 40-foot motorhome (with heat) in the driveway that night. No one complained, because the adventure of a lifetime was about to begin. Over the previous few months, we sold our house, property and Meadow Gardens, a garden center Jerry and I started eleven years earlier. We then sold, gave away or stored everything else we owned. We were hitting the road – excited to experience a totally different lifestyle for about nine months! Waking up to Pennsylvania’s first snowstorm of the season had us rushing to head south before we were snowed in. We didn’t have a detailed itinerary, but a general idea of where we planned to go. We like warm weather, the sun and the beach, so our tentative thoughts were to spend Christmas in Florida with a friend, make our way west through the southern states in the winter, travel up the west coast in the spring and probably see Alaska in June. Then we planned to travel east through the northern states and come back to ‘real life’ in August 2004. We had family and friends in a few states, so they were on our list of stops. We had some contacts at volunteer organizations that we planned to work with a few weeks. Obviously, the boys needed to continue their educations with books and lessons. We also wanted to see museums, parks and do factory tours to ehance their education. We spent the first weekend in Virginia seeing my sister and some friends. The weather was cold and they had about an inch of snow, so we were anxious to head further south. We wanted to see some of North and South Carolina, but the temperatures stayed in the thirties, so we drove until we reached Florida. We had our first weekend of warm weather and sunshine in St. Augustine State Park in northern Florida along the east coast. The lush, green foliage surrounding our campsite was a pleasant contrast to the barren trees of Pennsylvania. After a weekend of bike rides, building sandcastles and running on the beach, I began to realize how much I was going to enjoy this trip. Leaving a life where my schedule had been bursting with all the duties of a business owner – to looking at not just days, but weeks ahead with nothing scheduled was a glorious thought! As I looked in the mirror at the end of that weekend, I hardly recognized myself without my normal creased brow. 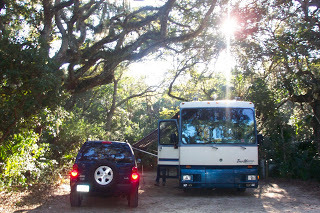 Driving south further, we set up camp at Sun and Fun Campground near Sarasota, FL for a week. The boys promptly disappeared for a time and then came flooding back excited with the options of the campground – shuffleboard, pool tables, miniature golf and an Olympic-size swimming pool were among some of the things I heard in the chorus of voices. “Keep your eyes open as you explore,” I announced, “your lesson on Friday will be to draw something you saw this week.” One of my goals was to have the boys draw a picture weekly. I figured this could be an interesting ‘travel log’ of their trip, along with providing them with a needed art lesson. When Friday rolled around, I pulled out the sketchpads and pencils, “What did you see or what impressed you this week,” I asked. “The swimming pool,” Jonathan promptly said. 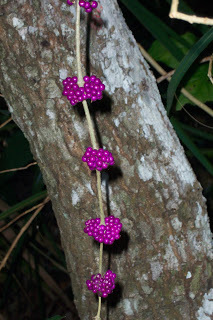 A branch of small, purple berries on a tree right outside the motorhome window intrigued Joseph and he set up a lawn chair directly in front of it and began sketching. He had quickly discovered that ‘snowbirds,’ older people from the northern states that spent a few months in Florida during the winter months, occupied most of the campsites. After an hour or two passed and the boys didn’t returned, I became concerned. Jerry didn’t seem to share my apprehension – maybe because he was quite comfortable in a hammock at the moment. I pulled out the campground map, saw there was a large arcade and headed in that direction. “Hey, what are you guys doing?” I called, as I spotted Jonathan riding my way. “Shh-sh,” I look around hoping no one heard him. Snowbirds are generally kind and gracious, but I didn’t want to take any chances insulting one. “Great,” I said, thrilled that the boys had other children to connect with. And yes, envisioning all the hours I would have to myself that week! They had a blast all week – swimming, biking and playing games with their new friends. We did a few hours of schoolwork a morning or two, but already my planned schedule was slipping. Because gosh, it was hard to keep them (and me) in the motorhome when the beach was only a short walk away. We took the Jeep for a day trip down to Key West, the last island. 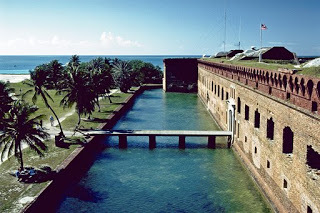 From there, we took a boat ride out to Dry Tortugas National Park, on an island 70 miles west of Key West, that holds Fort Jefferson, part of our countries defense plans in the 1800’s. As we boarded the boat, I knew it would be an excellent day. 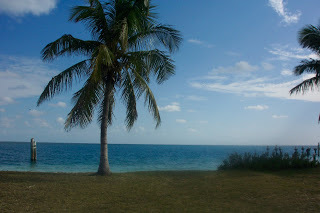 I didn’t have to plan anything – breakfast was served on the boat, lunch on the island and snorkeling equipment provided. Air and water temperature were around 85 degrees. We spent the day swimming, snorkeling and photographing some of the unusual fish and underwater creatures. It was a day that in hindsight seems almost surreal because it was so perfect. Next Saturday – the boys direct us to one of the largest paintball fields in central Florida, because they NEED to play paintball. Good read! Thanks for sharing… I look forward to reading your exerpts!